Cupcake survived eight days in the post. Photo contributed by Grove Lodge Vets. 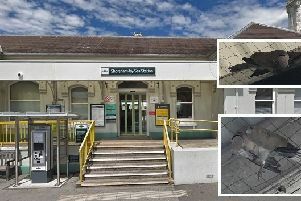 A cat has survived an eight day ordeal from Cornwall to Worthing after being accidently packed into a box. Cupcake the Siamese cat had a rather eventful week after she managed to sneak into a box of DVDs at her home in Falmouth, Cornwall. The box was then posted to an address in Worthing, more than 250 miles away. It arrived eight days later and the recipients had a bit of surprise as they opened the box to find their delivery came with a free feline. The buyers contacted the RSPCA who collected Cupcake and took her to Grove Lodge Vets in Upper Brighton Road, Worthing. A spokesman for the 24-hour veterinary hospital said: “This is probably one of the most extraordinary stories any of us at Grove Lodge Vets has ever heard. Cupcake is now recovering well. After a thorough examination vets found that she was microchipped. Her owner has been informed and she is expected to be picked up soon. RSPCA inspector Julie Parsons said: “Poor Cupcake was very lucky to survive. “Luckily, she made a quick recovery, and had been microchipped so I was able to scan her and track her owners down. “I couldn’t believe it when I found out they were all the way down in Cornwall - what a distance. A proper travelling cat. I never would have thought of putting a ‘Pet Found’ poster up down there. “It just goes to show how important it is to microchip your pets, and keep the details updated.